Alfred was born in 1898, the son of Daniel Brindley and his wife Mary Anne née Richmond. Daniel and Mary Anne had a very large family of eighteen children; six of whom died in infancy. The children included: Daniel (born 1880), Albert (1882), Walter(1885), Alice Maria (1886), Mary Jane (1887), Anne Louisa (1889), James (1890-1892), Frederick Stanley (1893-1894), Frederick (1897-1898), Alfred (1898), David (1901), Frederick Stanley (1903) & Richard (1907). Daniel senior’s career can be followed through census returns as he develops from a hawker selling items from door to door, to a fishmonger and finally a fish and fruit salesman. His career parallels that of his brother, Joseph and their father, also Joseph – together familiar to Newburians of the time as Brindley & Sons. They should not be confused with ‘J Brindley’, fishmonger of The Broadway and Cheap Street – this was James Brindley, probably related but not closely. Brindley & Sons had a shop at 88 Bartholomew Street, then 27 Cheap Street, presided over by Joseph jun (Joseph sen died in 1914) while Daniel lived in King’s Road, opposite the gas works, in Yarmouth Cottage, alongside which was a yard and premises, very probably part of the business. The next generation followed their fathers into the growing business. When war broke out in 1914 Daniel had at least eight sons still living; three were of ‘military age’ at the start of the war though there is no evidence of patriotic fervour - none were listed in the Active Service Rolls printed in the local paper. These listed the pre-war soldiers and wartime volunteers from Newbury and the surrounding villages, who were serving in some branch of the armed forces prior to the introduction of conscription in 1916. His first involvement with the army was in the Berkshire Yeomanry; before the war this was a part-time cavalry regiment, a part of the Territorial Force. When Alfred joined in 1916 this would have been no more than a training unit (probably the 3rd/1st Berkshire Yeomanry). Following a year’s training (men were not sent to the front until they were 19), Alfred was drafted abroad. This is probably when he was transferred the Royal Berkshire Regiment. His regimental number (41830) suggests that his transfer to the Royal Berkshire Regiment took place in mid to late 1917 – which coincides with his 19th birthday (men could not, officially, be sent overseas before that age). Alfred served with the 5th (Service) Battalion, Royal Berkshire Regiment and may well have joined them in France in time to take part of the Battle of Cambrai (20 November – 7 December 1917). If not he would have been a welcome addition; they suffered over 300 casualties at Cambrai. In March 1918 the Germans, bolstered by the addition of over half a million troops transferred from the Russian front, launched a massive offensive aimed at the British with the grand aim of cutting them off from their French allies to the south and pushing them back to the Channel. The plan did not succeed but the offensive did make massive inroads into the British held territory, advancing as much as 30 miles and threatening the key rail hub at Amiens. Both sides suffered huge numbers of casualties before the British, with French assistance, managed to hold the Germans. When the offensive was launched on 21 March the 5th Battalion Royal Berkshire Regiment was at Fleurbaix up near the Belgian border, well to the north of the German attack. Their main concern at the time was the rumour of a German attack on the Portuguese Division holding a section of the line nearby – a rumour that came all too true 2½ weeks later. However, the situation in the south was so alarming that the 12th Division (including the 5th Royal Berks) was transferred to the Somme front over 24-25 April. The following day the battalion took up positions defending the village of Martinsaart and the day after the Germans arrived. The battalion was in action for three days before being relieved on 30 April by the 23rd London Regiment. After a day’s rest the battalion was sent to defensive positions in front of Albert. On 5 April the enemy struck them again. The next day, after suffering many casualties the battalion was reorganised into two companies (as opposed to the four that were deployed the previous day). By the time they were relieved that evening (6 April) they had suffered 255 casualties. During one of these actions Alfred was wounded. He was transferred to one of the four Red Cross hospitals at Etaples on the French coast south of Boulogne where he died of his wounds on 8 April 1918. In ever loving memory of 41830, Pte Alfred Brindley, 5th Royal Berks, the dearly loved son of Mary Ann Brindley, Yarmouth Cottage, King’s-road, died of wounds April 8th, 1918, aged 19 years 5 months. From his sorrowing Mother, Sisters and Brothers. Alfred was buried in grave XXXIII. F. 8 at Etaples Military Cemetery, the largest Commonwealth War Graves Cemetery in France and the final resting place for 10,816 casualties. 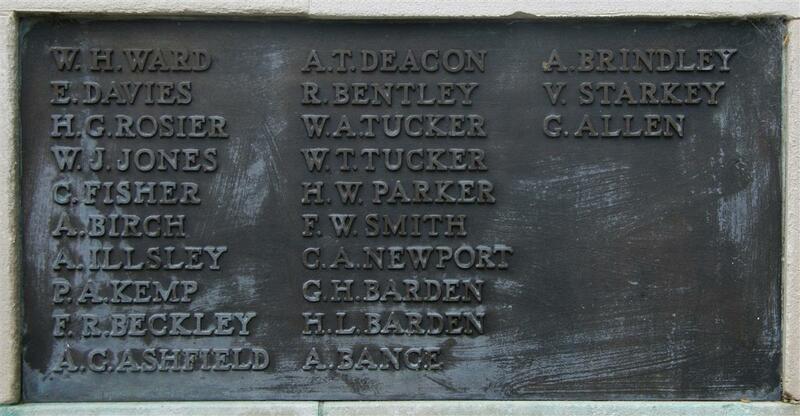 Locally Alfred is remembered on Tablet 6 of the Newbury Town War Memorial. Alfred’s brothers were also subject to conscription; however, so many WW1 service records were lost in the Blitz that it is not possible to know for certain whether they served. One service record has survived; that of Albert who was 35 years old when he was called up on 3 May 1917 for service in the Army Service Corps (ASC). As he was sent to France before the end of that month it is reasonable to assume that his service was related to his civilian occupation – even the army needs fishmongers. After 5 months in France he was transferred to an infantry battalion, the 16th King’s Royal Rifle Corps (KRRC). The transfer was a compulsory one, so we know that Alfred did not volunteer for front line duty, but, if he was fit enough and the infantry were desperate for more men (this was towards the end of the Battle of Passchendaele) it is easy to see how he could be caught up in the maelstrom. In February 1918 he was returned to England and the 6th Battalion, KRRC, probably as a result of some loss of fitness. In July he returned to the ASC and, in November 1918, spent two weeks travelling to Salonika. While on this journey the war ended. After almost a year in Salonika he was brought home and demobilised in September 1919. He died in Newbury in 1956, aged 74.